The Rwanda contemporary visual art scene is fairly young, where most artist are self-taught. Rwanda does not have any formal visual art schools, which is fascinating considering the talented and professional works I encountered during my art exploration trip to Kigali, the capital of Rwanda. I met a few artist who explained that art was a means to get out of poverty and get off the street to get a source of income. Some artist started painting at a very young age and continued to develop their skills to create stunning pieces of art. Most art works are sold through galleries and the works are also displayed in Hotels like Hotel Des Milles Collines, Manor hotel, Serena hotel, Heaven restaurant, embassies and other social location. The artist tend to adopt a collaborative approach, where they learn from each other and work together on art projects to put on shows and exhibitions as well. This was the case for Umoja wetu, where artists created one painting for Never Again. The works exhibited in the galleries I visited were mostly paintings and collage. I saw very few 3 dimensional artworks and no evidence of fine art photography. It was interesting to see that the art scene has moved beyond craft and the traditional artefacts often associated with Africa art. The art works created were of an international standard, although mostly aimed at westerners with the prices to match. As with a number of African countries, art does not seem to be appreciated by the locals or perhaps from the locals perspective, affordability might be an issue. Although, this is changing, particularly in South Africa and Nigeria who have a more mature art market with large number of local art collectors. Perhaps, one day this will be the case for Rwanda. The concept of photography as art appeared to be nonexistence. I spent a day in the company of Yakubu, a professional photographer, taking some pictures of activities on the the street around Kigali. Look out for my next post on my Street Photography with Yakubu. Yakubu is hoping to raise the profile of fine art photography to the same level of the fine art galleries in Kigali. He aims to achieve this by educating the youth and changing the notion that photography should not be limited to only weddings and special occasions. Yakubu wants to represent Rwanda in different art festivals and exhibitions and organize his own international festival of photography. Here are some galleries worth visiting, to pick up some unique pieces by a wide range of artist with varied styles and techniques. Inema Art Centre was one of the first galleries I visited during my trip. On arrival, I loved the artistic displays of sculptures and installations that greeted me. There were some very interesting pieces available. The Art works that struck me the most was that of jjuuko Hoods a Ugandan artist and by one of the owners, Innocent Nkurunziza who created some amazing sculptures from recycled materials. Inema Inema Arts Center has a number of programmes to foster creative arts in Rwanda. Through workshops, trainings, and hands on classes, the Inema Arts Center provides environment to bolster creativity. If you will like to try your hands art being creative, which can be booked via Vayando . Out of the four galleries visited, this was the most expensive and a little bit impersonal for my likening, but definitely worth a visit. Visting Niyo Art Gallery, was one of the hlighlights of my trip to Kigali. After my visit to all four galleries listed here, for me Niyo Art Gallery was by the fair the best, both from a hosting perspective and the good quality of works exhibited. I was welcomed and shown round and introduced to the different works showcased by Niyonsenga Pacifique the owner, who is an artist as well. 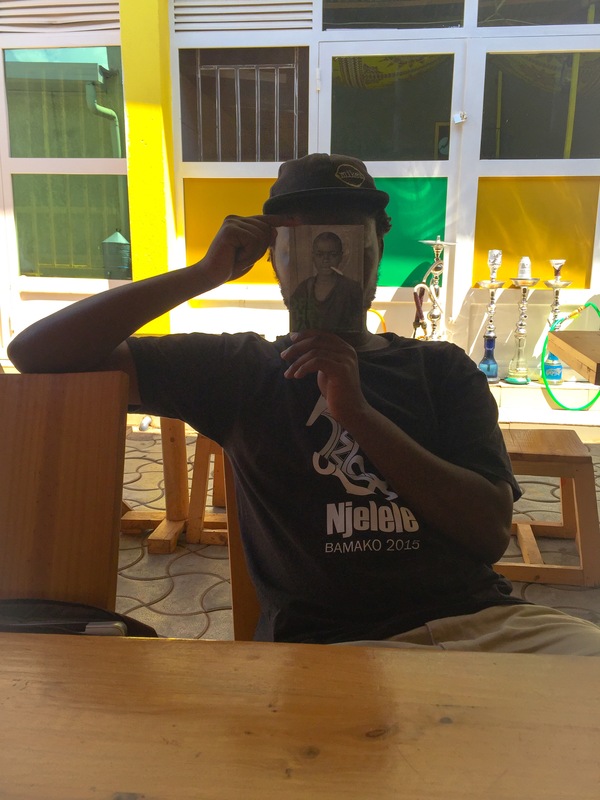 At just 23, Pacifique also runs arts and dance programmes for under privileged kids for them to have some form of vocation to get a source of income through Niyo Cultural Centre affiliated with the gallery. Niyonsenga Pacifique has been featured on CNN and toured the US and will be coming to the UK to give talks on how art can make a difference. 30% of the proceeds from his gallery goes to sending kids to school. If you are ever in Kigali, this is a must visit:) So far, they are working with 100 children and are responsible for paying the school fees of 48 kids. This includes street kids and those whose parents cannot afford to pay for their tuition. Yego Arts is currently being managed by Olivier Kwitonda who is an artist and has a unique talent for painting and distinctive mixed media works. The gallery is a little bit understated, as they have just moved to new premises. Olivier took me around and explained the works of the different artists. The art space has a wide selection of works. One of my favourite pieces was bought from Yego Arts, when I saw this master piece, I knew it had to come home with me. Watch this space, all will be reviled in my upcoming exhibitons. Address: Situated near Amaris Hotel and near Ogopogo Restaurant. Rwanda is big on Basket making, which has made its way to Macy’s in the US. Imingogo, another traditional art is made from Cattle Dung. Look out for my post on this. Here are some places you can pick up some exquisite Made in Rwanda pieces. Irembo Foundation is run by Ishimwe Bertrand, who is only 19. He is an artist and has a training centre that teaches women, particularly single mothers on how to sew and create hand crafts as part of Irembo Foundation which he founded and operates. The objective of the foundation is provide men and women with resources and training so that they can engage in income generating activities and become self-sufficient. In conjunction with his brother who owns Niyo Art Gallery they are responsible paying the school fees of kids that cannot afford to go to school. You can purchase a wide selection of African Print accessories and distinctive bags and slippers made out of canvas paintings, which I thought were absolutely stunning. Naturally, I left with a few. It was interesting meeting Ishimwe, his entrepreneurship and level of professionalism, at a young age was impression and inspiring. 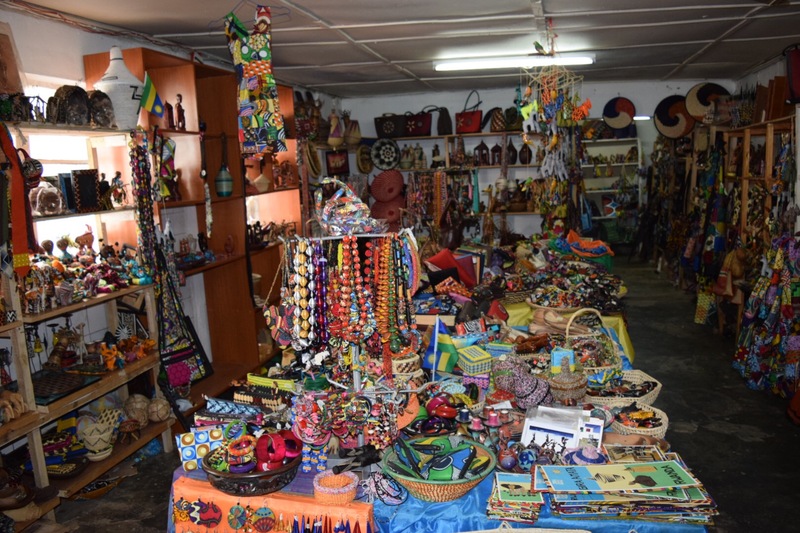 All African Art Craft is a cooperative, it provides craftspeople in villages around Rwanda with the opportunity to showcase their craft in the commercial centre of Kigali, where they will get maximum exposure of their craft. This is a must visit. They have a wide selection of craft, you will hard pressed not to leave with a few items. 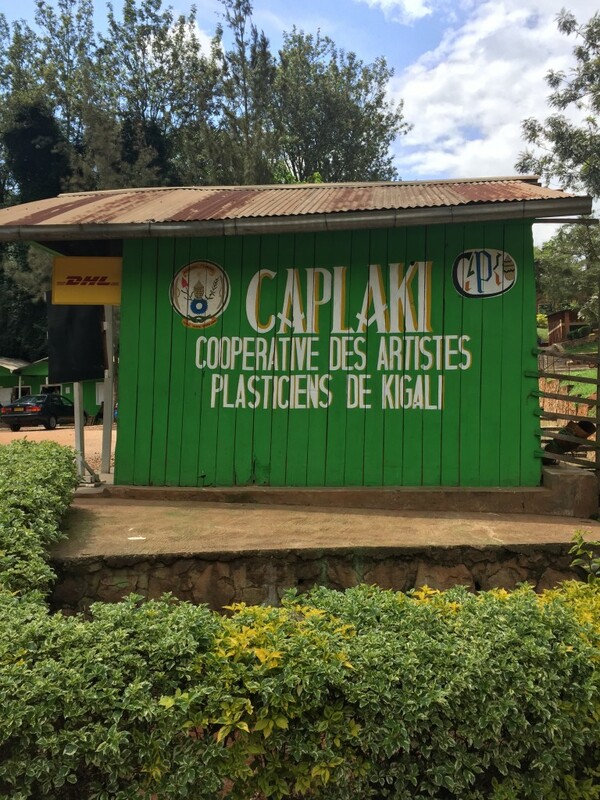 Caplaki is one of the main craft villages in Kigali and worth visiting. Although, after you have visited a few store you would have seen most of the items available in other stores. When you mention Rwanda, the Genocide comes to mind. When I told people I was going to Rwanda, they wondered why and tried to dissuade me. I am happy I decided to ignore their concerns, as I had a wonderful time and I really enjoyed the creativity in Kigali. If you want to learn about a country, I believe in seeing it through the eyes of artists, as they tend to observe their environment and see more than what meets the ordinary eyes. I was most impressed by the give back mentality of both the artists I met and the galleries visited, who believe in developing their communities through NGOs, creative programmes and art workshops for the kids. These programmes go to supporting underprivileged families in particular single mums and the homeless kids. Some of my favourite works include those of Manzi Jackson, Ishimwe Bertrand, Niyonsenga Pacifique, Christa Uwewe, Olivier Kwitonda. I was also drawn to the works of a couple of Ugandan artist jjuuko Hoods and fuggy. Some of which will be exhibited in the JonaQuestArt Exhibitions, so watch this space. It seems Uganda might be my next point of call for my next art exploration trip to Africa.